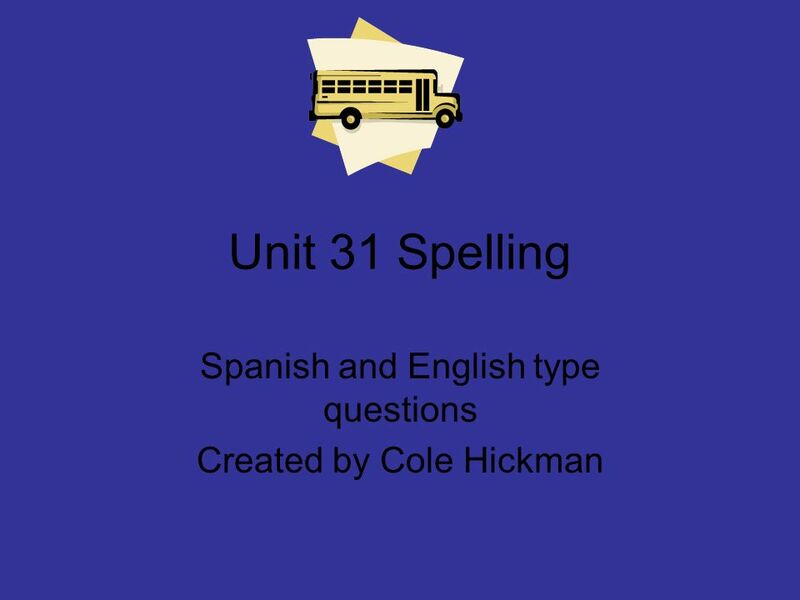 Unit 31 Spelling Spanish and English type questions Created by Cole Hickman. 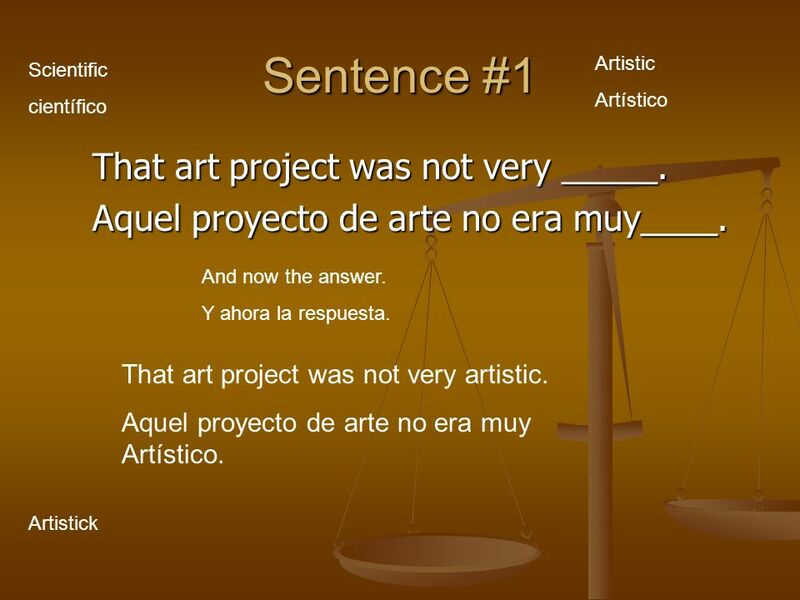 3 Sentence #1 That art project was not very _____. That art project was not very _____. Aquel proyecto de arte no era muy____. Aquel proyecto de arte no era muy____. Scientific científico Artistic Artístico Artistick And now the answer. Y ahora la respuesta. That art project was not very artistic. Aquel proyecto de arte no era muy Artístico. 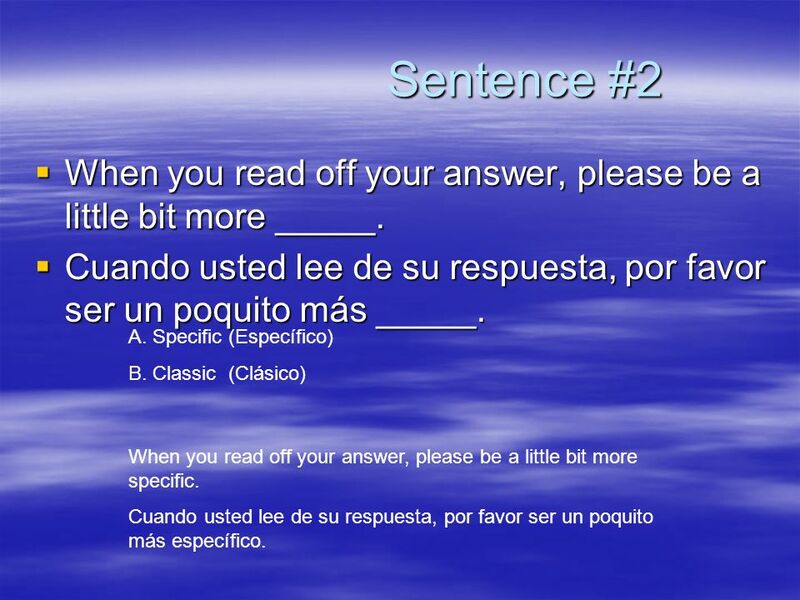 4 Sentence #2 Sentence #2 When you read off your answer, please be a little bit more _____. When you read off your answer, please be a little bit more _____. Cuando usted lee de su respuesta, por favor ser un poquito más _____. Cuando usted lee de su respuesta, por favor ser un poquito más _____. A. Specific (Específico) B. Classic (Clásico) When you read off your answer, please be a little bit more specific. Cuando usted lee de su respuesta, por favor ser un poquito más específico. 6 Sentence #4 That ____ play is very ______. That ____ play is very ______. Juego de ____ es muy ______. Juego de ____ es muy ______. 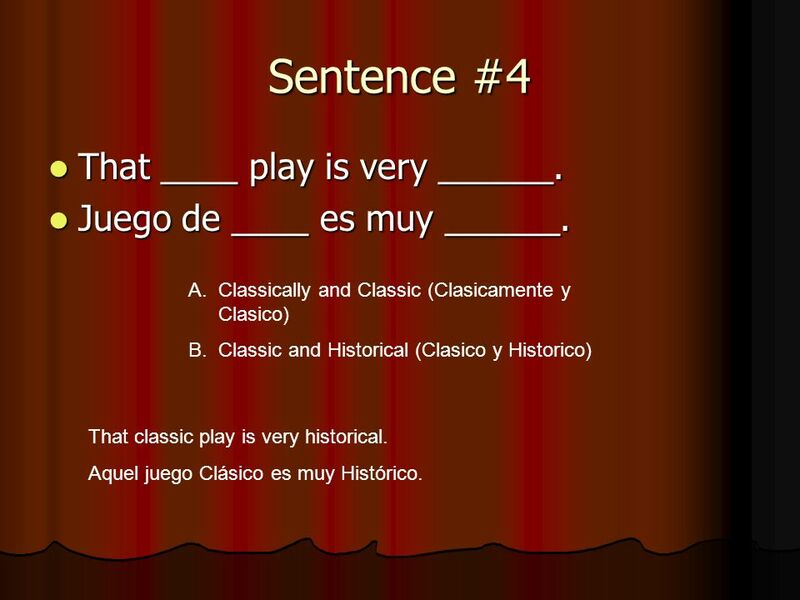 A.Classically and Classic (Clasicamente y Clasico) B.Classic and Historical (Clasico y Historico) That classic play is very historical. Aquel juego Clásico es muy Histórico. 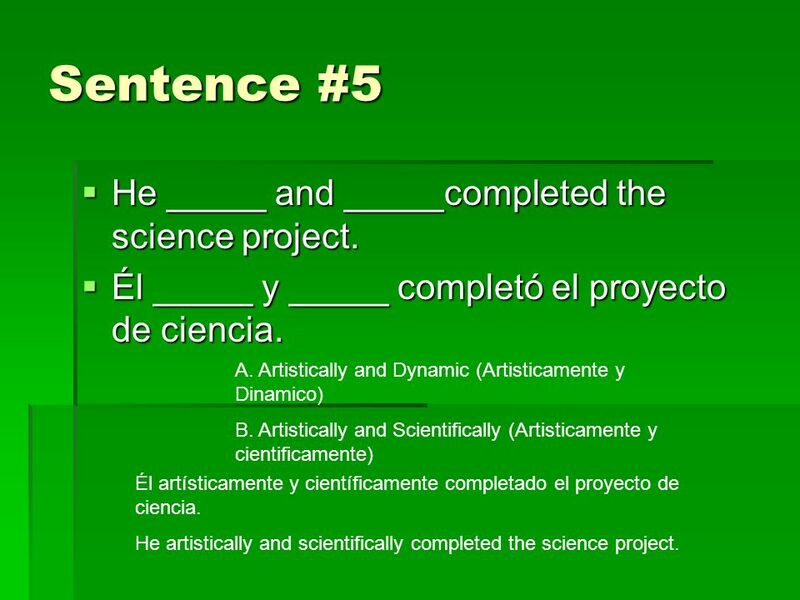 7 Sentence #5 He _____ and _____completed the science project. Él _____ y _____ completó el proyecto de ciencia. A. 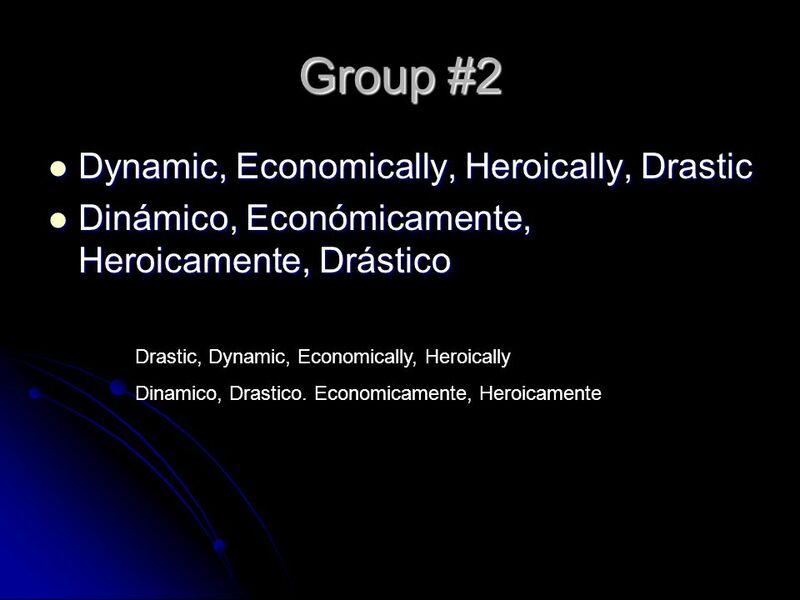 Artistically and Dynamic (Artisticamente y Dinamico) B. Artistically and Scientifically (Artisticamente y cientificamente) Él artísticamente y científicamente completado el proyecto de ciencia. He artistically and scientifically completed the science project. 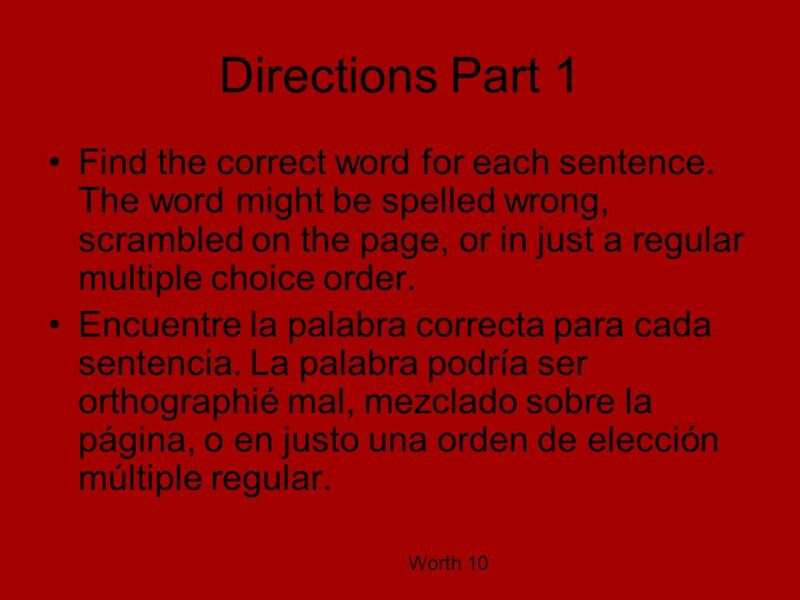 8 Directions Part 2 Now you will be given words that are not in alphabetical order…in your head…out them in alphabetical order. 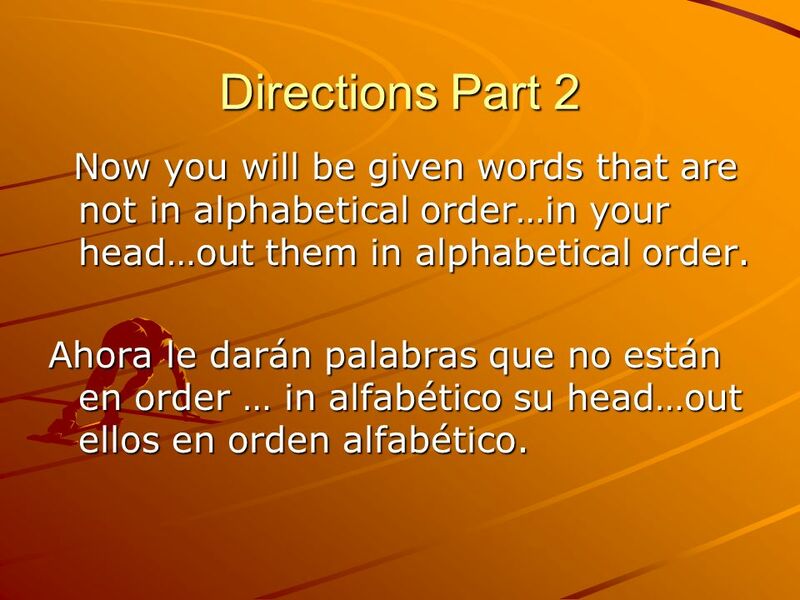 Now you will be given words that are not in alphabetical order…in your head…out them in alphabetical order. Ahora le darán palabras que no están en order … in alfabético su head…out ellos en orden alfabético. 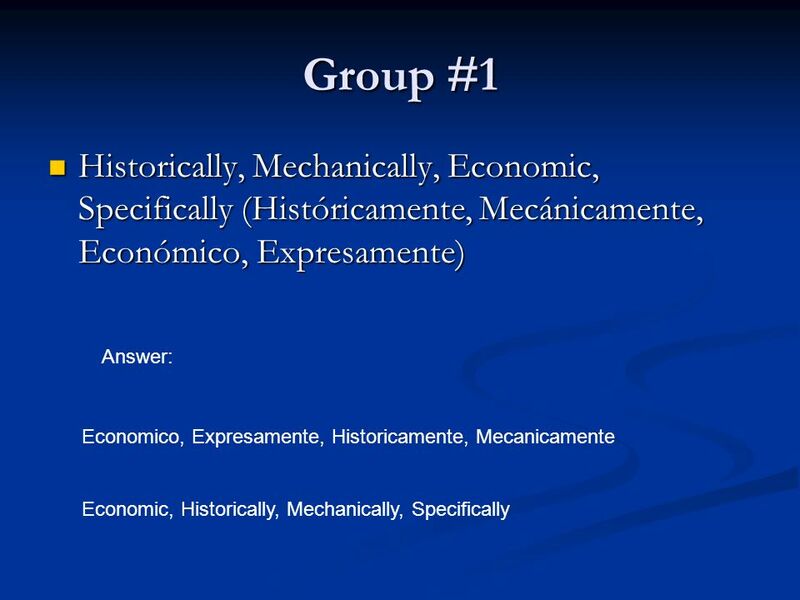 Descargar ppt "Unit 31 Spelling Spanish and English type questions Created by Cole Hickman." 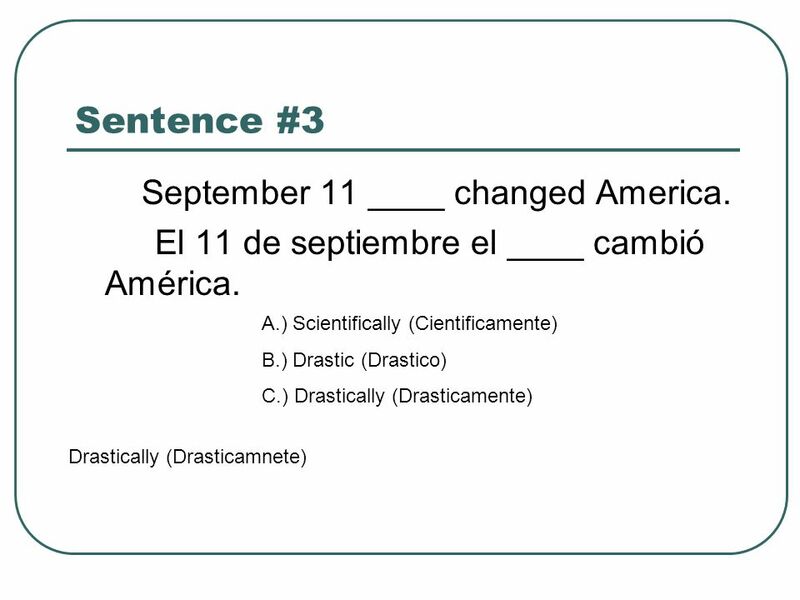 11/19 Hagan ahora: Answer the questions below in Spanish, include a.m. and p.m. in your answer. ¿A qu é hora es la clase de ciencias? ¿A qu é hora es la. Directions Questions will be presented on the overhead. You will write your class number and answer and then crumple up your paper and throw it into the. Español 1 Ms. Lewis - 3410. Explorar 0 ¿Cómo se llaman las personas en tu grupo? 0 Escribe los nombres. 0 ¿Cosas buenas? 0 ¿Quién conoce a todas las personas.